We live in a world where we are inundated with more information on a daily basis than we can possibly process. It is an over-communicated environment. There are so many unwanted messages bombarding us that often the ones we want get lost in the noise. It doesn't matter whether you are connected to the Internet or not. We get hit by information at every turn – at work, at home and even as we try to relax. Have you ever wondered that protecting security of consumers, businesses and the Internet infrastructure has never been more difficult? Cyberattacks on Internet commerce, vital business sectors and government agencies have grown exponentially. Equifax and Uber data breaches. Facebook and Cambridge Analytica. Cyberattacks and breaches threaten organizations and individuals around the world daily. 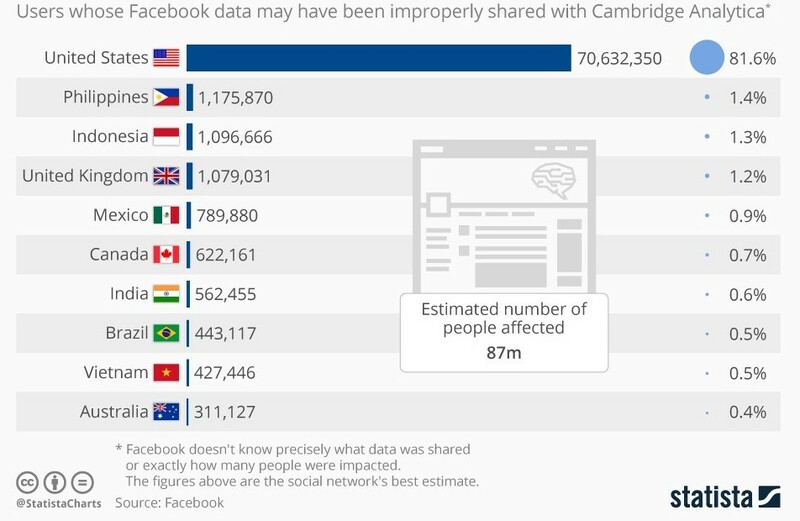 Here is the main point – Cambridge Analytica gained unauthorized access to data from more than 87 million Facebook users. Facebook says the data was shared improperly rather than hacked. This is a much larger figure than the previously believed 50 million Facebook users whose personal data was improperly shared with Cambridge Analytica. Facebook has promised to take a tougher line with apps and others who want to mine the mountain of data the social network has stockpiled about its two billion active users. “We exploited Facebook to harvest millions of people’s profiles. And built models to exploit what we knew about them and target their inner demons. That was the basis that the entire company was built on,” said Christopher Wylie, a Canadian data analytics expert who worked with Cambridge Analytica told The Observer. The U.S. topped the list with 70.6 million users – close to 82% of all affected users. Philippines and Indonesia were the second and third most impacted countries, respectively, while 1.07 million users were affected in the UK. Imagine what a state can do with the immense amount of data it has on its citizens. The amount of data we produce doubles every year. In other words – in 2017 we produced as much data as in the entire history of humankind through 2016. Every minute we produce hundreds of thousands of Google searches, Amazon, Twitter, Instagram and Facebook posts. These contain information that reveals how we think and feel. Whenever you come across a social media platform it is offered absolutely free to users. It is a push strategy of “taking the product to the customer,” grabbing the people’s attention and the product which is, essentially, the data that these companies are trying to sell. An organization can provide those that only allow the user to access what they need. The enterprise’s concern is the data; the employee’s concern is the device. In the IT security world, we care about both. But that's not all. Much of the technology is being developed by companies, who are in the business of capturing and selling our data and our attention to advertisers and others including Facebook, Google, Amazon, Twitter and Instagram. The more that is known about us, the less likely our choices are to be free and not predetermined by others. Now that most of the organizations have started adopting BYOD in some form, it is not just personal iPads and laptops that users are bringing into the office; they are also using the consumer apps available in their personal device for work purpose which leads to the next wave in mobility. In the very near future BYOD won’t be a ‘trend’ but a norm no one will think twice about. Everything started quite harmlessly. Search engines and recommendation platforms began to offer us personalized suggestions for products and services. This information is based on personal and meta-data that has been gathered from previous searches, purchases and mobility behavior, as well as social interactions. But it's not the intent or the statements people in technology make that matter, it's the structures and business models they're building. And that's the core of the problem. Either Facebook is a giant con of half a trillion dollars, and ads don't work on the site, and it doesn't work as a persuasion architecture, or its power of influence is of great concern. It's either one or the other. It's similar for Google, too. And many of these ad-finance platforms boast that they are free. In this context, we are the product that’s being sold. Think of all the data that Facebook has on you – every status update that you have ever typed, every messenger conversation, every place you logged in from, all your photographs that you uploaded there. If you start typing something, change your mind and delete it, Facebook keeps those and analyzes them, too. And it won't stop there. It is estimated that in 10 years’ time there will be 150 billion networked measuring sensors, 20 times more than people on Earth. Then, the amount of data will double every 12 hours. Again, the more that is known about us, the less likely our choices are to be free and not predetermined by others. Today, tech companies’ algorithms know pretty well what we do, what we think and how we feel—possibly even better than our friends and family or even ourselves. Not to mention it tries to match you with your offline data. Companies also purchase a lot of data from data brokers. The world is becoming increasingly networked and ever larger amounts of data are accumulating. We are talking about things like growing volumes and varieties of available data, computational processing that is cheaper and more powerful and affordable data storage. Stored data could be everything from your bank statements, Fintech accounts and financial records to your browsing history. They know many of the websites you visit, all the sites you are forced to sign into using your Facebook information, the drafts of posts you delete, what music you listen to and where you are at all times of the day when the app is open. They encourage deep surveillance on all of us so that the machine learning algorithms can work. That’s why Facebook wants to collect all the data it can about you. These algorithms may be able to detect people’s sexual orientation just from their dating profile pictures. In addition to searching for information on the Internet, buying things on ecommerce sites, booking app-based cabs and making payments and transfers on online payment platforms. They will also buy more devices, including wearables and smart speakers, which gather large amounts of data. You may have struggled to take data harvesting seriously because the "targeted" advertising on your Facebook feed – the last thing you looked at on Amazon and some dating sites – seems too lame to be nefarious. Take it seriously. Some software platforms are moving towards “persuasive computing.” Big tech giants like Facebook allow firms such as Cambridge Analytica to syphon away 87 million user profiles, while the average Internet of Things device is so easy to hack that a kid can do it. I didn’t really feel like contacting the developers of 72 different apps before deleting my Facebook account, so I am unclear about the fate of the data they have amassed. Presumably it’s all floating around in the cloud somewhere. So, I would urge you to extricate yourself from social media as much as you can. 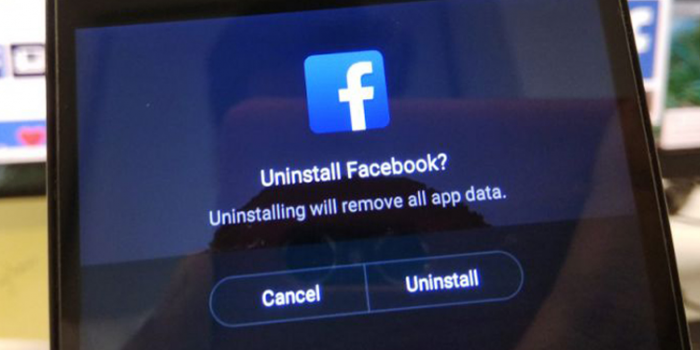 Deleting your Facebook account may not put an end to the surveillance state, but it sends an important message to big tech that we don’t trust them any longer. And mind you, Facebook doesn’t own your content, you do.